I can't believe I'm scything this, but before this recipe I never had cooked quinoa before. Now, I had eaten plenty of quinoa, but cook it I had not. What was wrong with me? Not only is it delicious, but it is easy to make. You can make your life so much easier by making it in a rice cooker, but I took the hard route and easily made it on the stove top. I think what I like most about a quinoa salad is that it's so adaptable to what vegetables are in season… or like me, what you happen to have in your pantry. Summer squashes? Roast them up and throw them in. If you're like me, use some peppers, broccoli and onion; essentially the only good produce Trader Joe's had that evening. Also, I really think you guys deserve something good and healthy after the past few recipes. Yes, the salted caramel peanut butter brownies are incredibly delicious but won't help you fit into those new skinny jeans hiding in the back of your closet. Also, happy birthday to Julie McComish and Emily Arntson!! 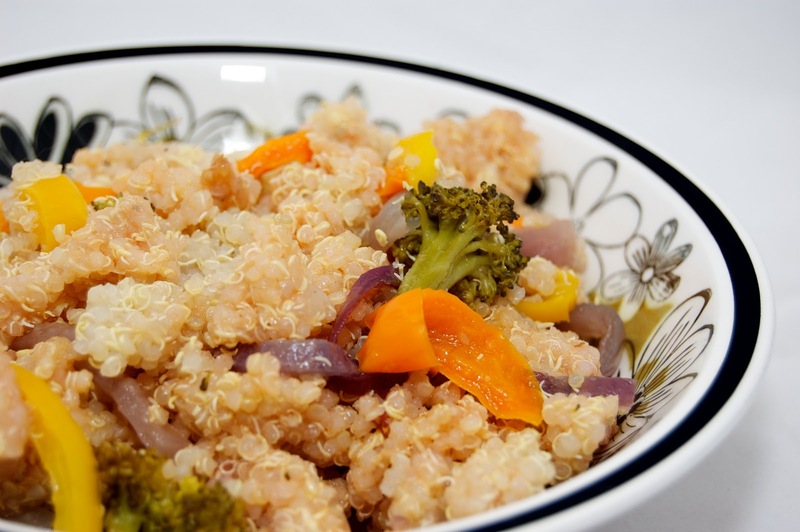 Soak quinoa in water for 30 minutes, drain and set aside until ready to use. Preheat oven to 400ºF and adjust rack to middle position. Bring stock to a boil in a large sauce pan. Pour in quinoa and bring to a boil. Lower heat to low and cover with a lid. Cook until quinoa is soft and stock has been absorbed, about 15-20 minutes. Place vegetables on a large baking sheet and toss with olive oil. Season with salt and pepper. Roast vegetables in oven until edges are golden, about 30 minutes, stirring half way through roasting. Cool. Pour the quinoa in a large bowl. In a small bowl whisk together tomato paste and lemon juice. Pour mixture over quinoa and stir until incorporated. Add vegetables and salt and stir. Serve at room temperature. I tried to fix the typos in my comment but it won't let me delete it! Guess that's what I get for rushing and trying to fly under the radar at work! One Green Tomato - I pre-soaked mine, I didn't realize I forgot to mention it in my post! And I know allll about checking out food blogs under the radar at work, no worries!